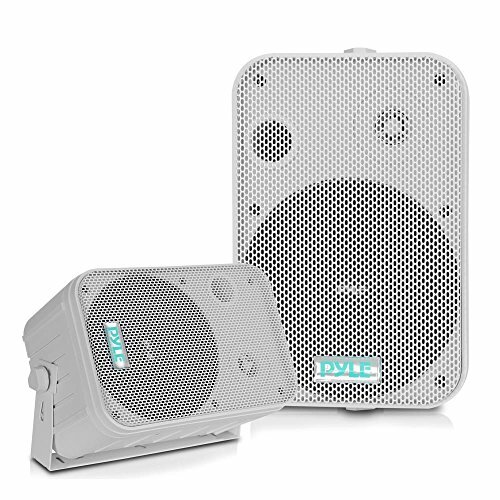 These white Pyle indoor/outdoor waterproof speakers are excellent for use on boats, decks, patios, or by the pool - anywhere outdoors. They're completely waterproof, thanks to the heavy duty ASB construction. And they're powerful - 500 watts max. A 6.5” aluminum injection cone woofer provides the , while a 1” high compliance Mylar tweeter pushes sweet highs. A capacitor crossover network separates these two channels discretely for a brilliant sound. Connect wires easily and effortlessly using the quick connect speaker terminals. The bass reflex vent boosts the bass response for a deeper, more powerful sound, ultimately delivering a frequency response of 30 Hz to 22 kHz. Mount using the unique spring loaded mounting system. The mesh grills are rustproof and removable. Sold as a pair.